If you love graphic design twists on literary classics as much as I do, you'd be equally riveted about a new collaboration between designer extraordinaire Jessica Hische and Penguin art director Paul Buckley, who set out to give 26 beloved works of literature vibrant, minimalist new typographic covers for Penguin's forthcoming Drop Cap series. Each cover will depict a different letter of the alphabet, with which a famous author's last name begins, illustrated in Hische's signature style. 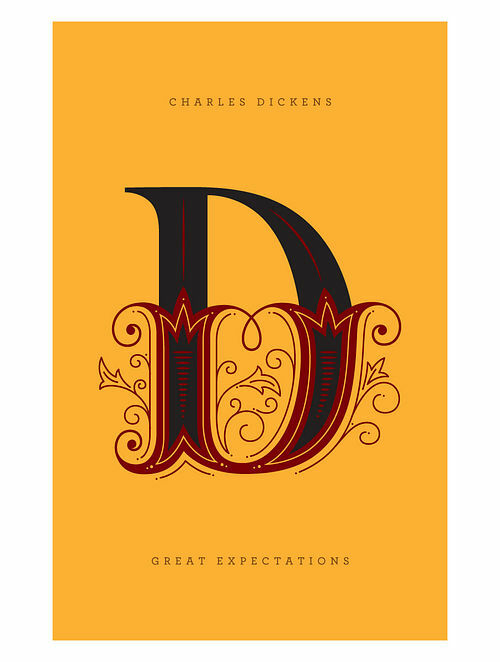 D is for Dickens. The orphan Pip is destined to become a blacksmith like his brother-in-law Joe. But when Pip meets the beautiful Estella Havisham, he yearns for a gentlemans education in order to woo her. A mysterious legacy answers his ambition, and changes the course of his life, taking him far from the Marshes of youthfar, so he thinks, from his early terrifying encounter with an escaped convict, and his sisters class resentments. In this fictional autobiography, Pips coming-of-age story becomes representative of the changing social landscape of nineteenth century England. As Pips education provides upward social mobility, he must also learn hard lessons about self-delusion and forgiveness, love and loss, and the true nature of his Great Expectations.